I am out of blog action for a few days as I dropped my laptop and killed the hard drive...of course I had not backed anything up for ages...at least the last 12 months...so many pics lost...at least I have the pics I have posted previously on the blog albeit they are now of low resolution. So sorry no pics this post! It has been a week now and I am still waiting to hear from the repairers...I am secretly hoping that they have been able to retrieve some data for me but they had said it did not look promising as I dropped it while it was on. Fortunately insurance will cover the replacement hard drive but alas not my stupidity...this is the second hard drive I have killed in just over 2 years...you think I would have learned...I promise you I have now! So if you haven't backed things up recently...take a lesson from me and do it now! The renovations are moving along nicely but there has been a major issue with the plumbing (old building) but that is slowly getting sorted as there are a team of plumbers here working on it from 8am-6pm each day. I am now getting to the pointy end of the renovations and it is so close to completion...the tiles are being laid in the bathroom, the kitchens and light fittings are being installed plus the painting is nearly complete...should all be finished in about 3 weeks. My basement has been completely taken over by plumbers and electricians, they are even in the studio...so no work happening there for me...I am feeling a little guilty about the BAO project but my head at the moment is not in the right space...I don't think I will have the time to get back into it until I have the apartments all set up and ready to book. 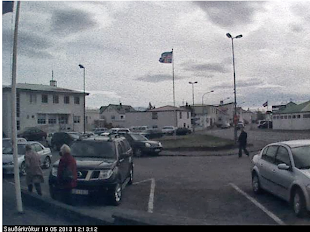 Olga and I travelled to Akureyri to purchase furniture, linen, kitchen utensils etc for the apartments...Ross was on a holiday from work and so Henry stayed home with his dad whilst Olga and I shopped....still did not get everything I need but we are close. In other news we are in a bit of a heatwave, the weather is sooo pleasant I have turned the heating off in the apartment and am very comfortable walking outside without jacket, gloves scarf etc....it feels quite summery. The weather though is so unpredictable here...only last week we had a major blizzard and it was snowing fiercely. We are now well into + double digits...one of the plumbers told me he was having trouble working in such hot conditions...Hah! Today it is forecast for 18°, tomorrow 16° and Friday again 18° with lows overnight of a sweltering 9°...might be a few more plumbers complaining before the week is out! I hope it stays this way for a while....Iceland is very beautiful on warm sunny days. Hopefully I get my computer back in the next day or so and can finish the website for the rental apartments and post some pics of the renovations...I am very gratefully using my son's old laptop to check emails etc but it is very slow. Thanks for stopping by and enjoy your week! I am still kicking myself re the photos...I keep remembering some that I had and get a twinge of pain. The apartments will be available for rent from mid July and we will just see what happens...it will take a year for me to understand the ebb and flow of holiday apartment rental. Poor Vicki, when something happens to your computer you feel like you've lost a limb! Hope you're back to normal soon. Yes I felt sick! But slowly getting back into it. It is just so annoying when things like your address book are empty and there are no bookmarks and I just have to start from scratch again. However it is my own fault. Sorry for your misfortune. It worries me when so much "stuff" is contained in such a fragile container. There is an opportunity for some brilliant engineer to fix this issue, but in the meantime we are all living in a fragile data world. All I can say Jon is back up in at least in two other places. One of my external harddrives has also decided to have a wobbly! Gosh I miss your photos. Hope the computer is up and working soon. Yes I have decided that I just need to take my camera everywhere to build them up again. When stuff happens to your hard drive, it's always at a time when you haven't done a backup in a while. I hadn't backed up my iphone for quite a while before I dropped it in the snow in Iceland, even though I expressly brought my laptop with me to keep it backed up! I hope they can retrieve your data. Exciting that the apartments are nearly done! Maja, I am thinking of getting a drop box or icloud besides an external hardrive for back up. Only about a week to go and the builder will be finished. Yay! Give Olivia a kiss from us here! Hi Vicki! It seems losing data is a fact of life for most of us these days - but it is a dreadful feeling. I do sympathize. As for BAO - it is a guilt-free zone, by Sara's decree, so please don't pressure yourself. It is meant to be a fun experience so just relax until you can return to it. All the best. Amanda, I am coming to terms with the lost data, but will try and back up more often now. As for BAO, just can't get my head in to that space at the moment but will once the build is complete and the business up and running. It is great to know there is no pressure ...other than what I place on myself.